This ontology provides a data model and vocabularies for describing the National Curricula within the UK.Copyright © 2013 the British Broadcasting Corporation. This work is licensed under a Creative Commons Attribution License. This copyright applies to the Curriculum Ontology and accompanying documentation in RDF. This ontology uses W3C's RDF technology, an open Web standard that can be freely used by anyone. You can download the Curriculum Ontology in TTL format. Some instance data conforming to the Curriculum Ontology can be found BBC Knowledge & Learning's GitHub account. Where possible, the domain model uses curricula terms such as Topic, Field of Study and Programme of Study that are common in the curriculum domain. 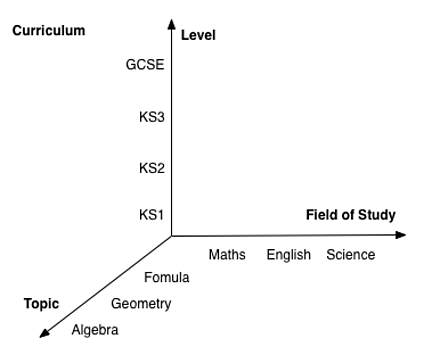 The curriculum is modelled as a 3-dimensional space, as shown in the diagram below. Topics of Study, which are the combination of Levels (stages of education), Fields of Study and Topics, are the atomic or elementary units of a curriculum. The generic data model may also be applicable for describing curricula taught in other countries or areas. The Curriculum Ontology has been designed to organise content in a way that allows students and teachers to navigate and discover learning resources via the national curricula. It achieves this by providing broad units of learning (e.g. a Topic) and more granular units of learning (e.g. a Topic of Study). The rationale for these concepts in the domain model are outlined below. A Topic can highlight the content of the learning resources in a more specific way than at just as a Field of Study e.g. Geography. Mapping content to a Topic of Study makes it easy to find specific content whilst mapping to a generic Topic allows users to discover a wider range of content. A Topic across Fields of Study. For example, "energy resources" is a Topic of Physics and Geography, but the learning content for "physics energy resources" and "geography energy resources" can be different. Topic synonyms. The topic of "algebra" is usually described as "relationships" in the Scottish national curricula but is described as "Algebra" in the English curricula. Fields of Study are published by Government bodies. For instance, the Fields of Study taught at primary schools in England are published by the government here. In general the national curricula define the breadth of a field of study but do not provide a prescriptive list of individual topics, although in some levels (e.g. GCSE) exam boards do specify a list of Topics of Study for each Field of Study. A Topic across Fields of Study. As mentioned previously, some Topics can be used across Fields of Study. The ordering of Topics of Study is a key requirement in the Curriculum Ontology, because some Topics of Study can be pre-requisites of others. For instance, students have to learn the English alphabet before English grammar. The TopicOfStudyList class uses the Ordered List Ontology to curate the sequences of Topics of Study. The Ordered List Ontology has been adopted to capture the sequential order of Topics of Study. LRMI (Learning Resource Metadata Initiative) was used as a reference. The concept of educational phase was imported from the data schema underlying education.data.gov.uk. The 'A Curriculum Ontology' work was a precursor to the development of this ontology. Below we present the mappings between the Curriculum Ontology and the Schema.org educational vocabulary. The purpose of the mappings is to describe learning resources from an educational perspective using two distinct vocabularies, the Curriculum Ontology and the Schema.org educational vocabulary contributed by LRMI. Using these vocabularies to describe learning resources enables easier discovery of content by search engines and other organisations. The candidate mappings between the Curriculum Ontology and Schema.org are expressed in the figure below. 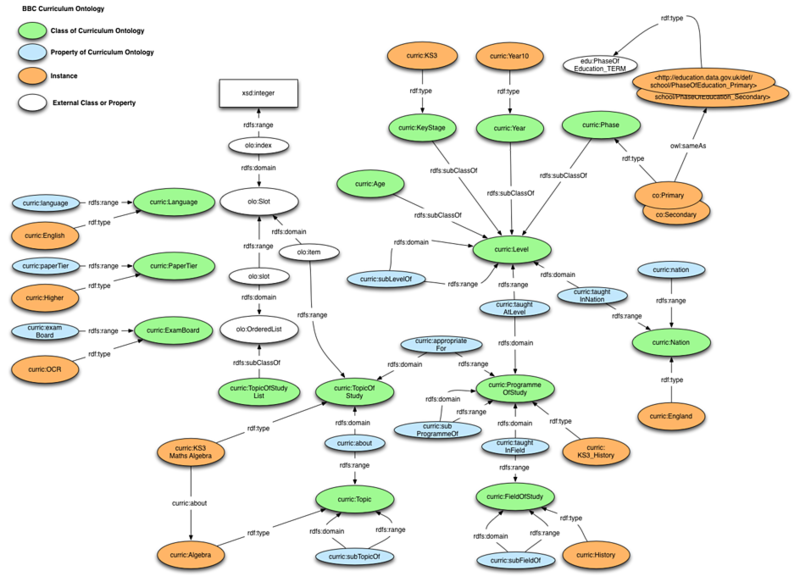 The diagram demonstrates Curriculum Ontology classes subclassing the Schema.org AlignmentObject. The AlignmentObject describes the alignment between a learning resource and a node in an educational framework. The Curriculum Ontology classes shown in the diagram share the same intent as the Schema.org AlignmentObject, thus the Curriculum Ontology classes sub-class the AlignmentObject class. The AlignmentObject class provides an alignmentType property that describes the type of alignment being specified. In the diagram, there are two types of alignment, 'educationLevel' and 'educationalSubject', these types allow alignment to the respective Curriculum Ontology classes. OWL restictions are used to enforce that correct alignmentType properties are used. It is expected that these mappings will evolve with the development of the Schema.org and LRMI vocabularies. 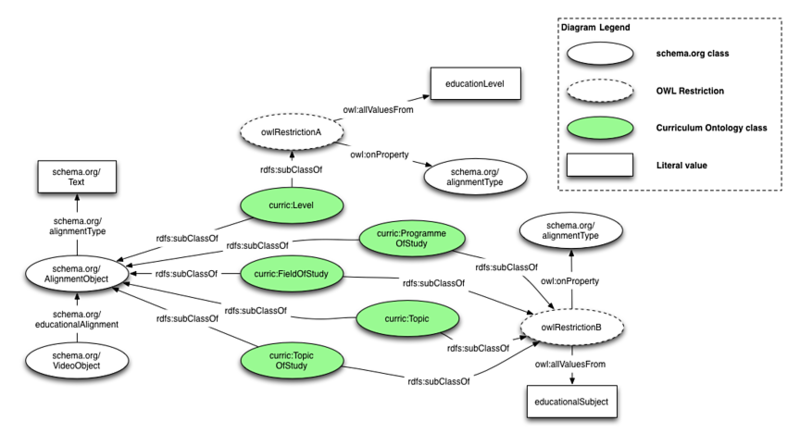 The following diagram depicts the classes and properties defined in the curriculum ontology. Age or age range is a way to specify the stages of education. Exam board is the organization holds some exams. Fields of study refers to the disciplines of a curriculum, e.g. Science, Maths, Science, etc. Key Stage is a way to specify the stage of the state education system in England, Wales, Northern Ireland. Examples of language are English, Welsh, Scottish Gaelic and Irish Gaelic. Levels refers to the stages of education. Typically, there are four different ways to specify the levels: age range, year, key stage and phase. Nation is the concept to describe the four parts of the UK, i.e. England, Wales, Scotland and Northern Ireland. Paper tier reflects the difficulty of a exam. It can be standard or higher. This concept is borrowed from the controlled terms for describing phase of education, which are published by the data.gov.uk. The phases of education include Primary, Secondary and 16-Plus. A programme of study is the combination of a nation, an educational level such as Key Stage 3 and the subject being studied, Science, Maths etc. Topic can highlight the content of the learning resources in a way more specific than the Field of Study. For example, energy is a topic of physics. Topic of study is topic within the context of a programme of study. It aims to provide a formal learning context to an asset or a collection of assets. Year is a way to specify the stages of education. Link topic of study views to topics. Link topic of study to a programme of study. The PID of the depiction (image). Specify an asset is useful for preparing exams provided by an exam board. The property of an asset being in a specific language. The lower bound of the age range of a educational level. Link topics of study to BBC assets. Capture the hierarchy of fields of study. Capture the hierarchy of level. Capture the hierarchy of programmes of study. Capture the hierarchy of topics. Specify the level of a programme of study. Specify the field of a programme of study. Specify the nation of a level. Link a topic of study or a programme of study to an ordered list of topics of study. The upper bound of the age range of a educational level.